Hi everyone! My name is Amy and I blog over on A Little Boat Sailing. I'm thrilled to be over on Kayleigh's blog today whilst she jets off on holiday. Seeing as it is Sunday I hope you can all sit back, relax and enjoy the post I have for you today. Traditionally Sunday has always been the day of rest however these days nobody ever really stops. Most shops are still open, the supermarkets never seem to close and there is always a mountain of laundry to do which leaves very little time for most of us to sit back, put our feet up and have a nice relaxing day. In a way I’m slowly trying to reclaim this day back for myself therefore I tend to start it off with a lie in because nothing makes me happier come the weekend when I can turn off my 6am alarm. In my family a roast dinner on a Sunday is pretty standard, it’s the best meal of the week and goes down an absolute treat. After this I find myself disappearing for a few hours to catch up on some of my favourite blogs as well as to plan a few posts for the upcoming weeks of my own. Generally I find writing blog posts to be rather therapeutic as it’s a nice way for me to relax because I’m doing something I really enjoy. Having said that the best part of the day is when I fully unwind and take a nice relaxing bubble bath, a decent pamper session is most certainly welcome on a Sunday afternoon. 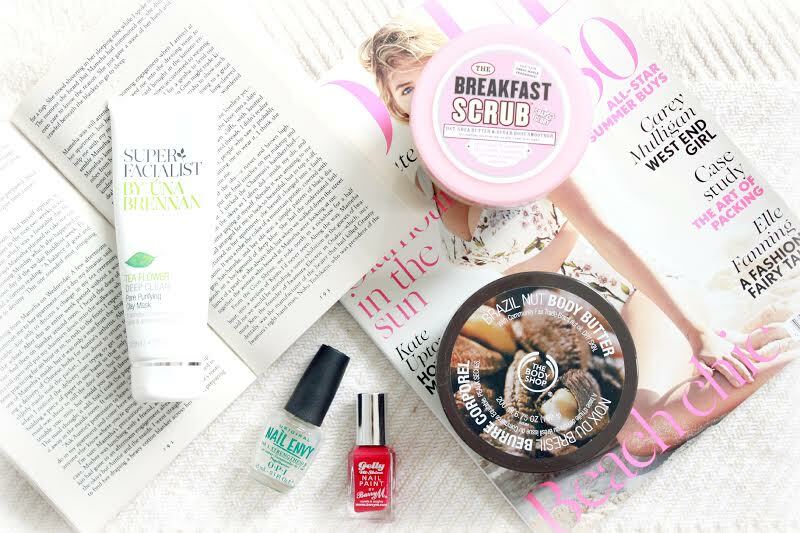 The Soap and Glory Breakfast Scrub is the perfect product to kick start a pamper evening whereby it is ideal for removing dead skin cells leaving your skin nice and fresh for the upcoming week, it’s also the perfect preparation step before moisturising. My current moisturiser of choice comes from The Body Shop Brazil Nut Body Butter which is one of my all-time favourites, despite being a fan of the more fruity options I find myself always coming back to this one. Come 6pm on a Sunday I’m normally in my pyjamas which is the opportune moment for me to put on a clay mask. At the moment I’m currently using the Super Facialist Tea Flower Clay Mask which is fantastic for congested skin. Whilst the mask works its magic I tend to sit back and read or delve into my nail polish collection to pick a colour to wear to work for the next day. The Barry M Gelly Nail Polishes are still to this day some of my absolute favourites to wear therefore it’s no surprise that I chose the shade pomegranate this time around; this is the perfect colour to wear to brighten up a Monday morning. The best way to finish off a Sunday in my eyes is with a nice cup of tea, a biscuit and of course the beauty blogger chat at 8pm; see you there! This soap and glory scrub is amazing and smells so good :) !! Such a calming read. I'm jealous of your Sundays! I have always seen Sundays as a quieter day; until I went to University, I never really went shopping on a Sunday; they were, and still are, a day of baths, family, roast dinners, reading, boardgames, films and day trips to the local National Trust area. I'm glad to see it's not just me! I find blogging as a way to relax as well, but only when I don't feel pressured-if that makes sense. Anyway, great guest post Amy! I absolutely love Soap and Glory Breakfast Scrub, the smell is amazing! I have started trying to make sure I chill out on a Sunday and work harder on the other days of the week :-) I really enjoyed this post! Beauty and Sunday go hand in hand in my house always have done. Great post!